ROME - Interior Minister Matteo Salvini launched a new attack on Jean-Clean Juncker Wednesday insinuating that the President of the EU Commission was “not sober” when he criticized Italy’s budget plans. This followed Tuesday’s war of words when Salvini commented on Mr Juncker’s suggestion the Italian budget may lead Italy down the same debt-ridden path as Greece. “I speak with sober people who do not make comparisons that are neither in heaven nor on earth,” he told afternoon programme Tagadà. “In a big family, there are no children of Series A or Series B. If someone in Brussels babbles because they regret the loss of a precarious and fearful Italy – maybe to make business at a lower price using spread and the markets to scare people – they found the wrong Minister and the wrong Government." 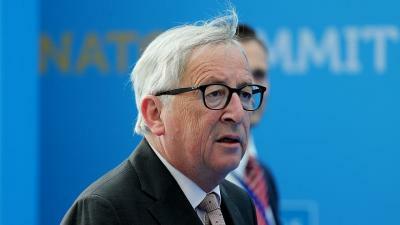 This isn’t the first time Mr Juncker has been accused of being drunk. In July, Austrian MEP Harald Vilimsky criticised the EU President for turning the EU into a “laughing stock” after footage emerged of Mr Juncker struggling to walk alongside other world leaders at a NATO summit. Mr Juncker strongly denied he had a drinking problem and told reporters he had suffered “a painful attack of sciatica, accompanied by cramps." The EU President has suffered with sciatica since his involvement in a serious car accident in 1989, which left him in a coma for three weeks and wheelchair-bound for six months.